VOTE VOTE VOTE and think about me being on that big box of da Bissell Vacuum Company and trotting my paws around da Nashun for PURRmotions! Yep uh huh, me and my paws are out to win the BISSELL PET OF THE YEAR AWARD. Woo hoo - But I need your vote to do this - voting ends for this semi final round on Monday Feb 2nd 7pm PST so please tell all your fantasticat furiends and vote! In dis diversa-cat world composed of abundacat types of fantasticatical folks - oh shure we're all a widdle smitten kitten different - there's someting we all have in common - yep uh huh, a bed! You've got a bed, I've got a bunch of beds, everyone has a bed whether you've 2 legs or 4. Ya gotta have a bed to rest your head during that slumbering catnap. So me and my mighty meowster paws have been out testing diversakitty salooshuns to find the PURRfect bed. 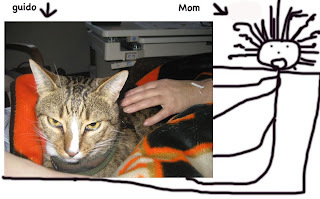 Immediacatically, I gave GUIDO's 4 Paws DOWN to the TemPURRpedic (my MasterCat Card can't afford it in this purr - oops I mean poor - economicat climate that's got us all in da litter box, and besides da TemPURRpedicat masheen well it's giganticat & moves in the night when you moves - scareeeee!) and Serta was sorta not comfy. My eyeTAILyun buffed bod jumped on di BeautyRest in di showroom - not so beeYOUtiful but how cool to think I could improve my beauty while resting! So you're curious as a cat as to what rocks my 4 white socks and gives me a PURRfect uninterrupted snooze??? Kudos to Morgan fur creating this customized creeayshun (AND it's affurdable too and Morgan ships anywhere in da World where you sleep). The Morgan Bed absoluticatically will purrvide you a complete night's rest - and a complete day's rest - AND a complete afternoon's rest too - it doesn't get any betta danna datta (dats eyeTAILyun). Basicatically speaking, this bed werkz and is gonna offer you rest galore - like rest-o-maticat- imagine a catzillion hours of rest! Hey isn't dat what a bed is fur? Me and myself tested so many beds, that myself passed out in the closest Morgan Bed I could drop my eyeTAILyun self and tail into! OH furgot to say the MORGAN BED is not just fur felines - it's fur Da Dogs too! Furiendly diverse beds hand made by Morgan in abundacat sizes. Catzowey! I got so relaxacatted in my Morgan Bed that I had to roll out onta da fantasticatical hard, like reeeeeeally hard fulloor, in order to not doze away the day cuz it would not be molto bene if the day got away from me and my four feline paws. Ya know, us and ourselves are not supposed to miss a meowment of the day they say cuz life is Catzowey! Catzowey! No matter whata fantasticat part of the globe you call home, we're all part of meowvalous history on January 20th 2009 and being I'm just 2 years young, it's my FURst Inawwwwwgurashun and I'm not gonna catnap thru the festivities. So I've been checking out and under to be shure my computer hookups are in fine feline working order cuz my eyeTAILyun smart self wants to be in front of my screen fur the whole giganticat giorno tomorrow. And I don't wanna my guests to have conniptions of Hiss Fits if they can't see any ting- Bet your most pricey impurrted sardine that I'd be heading right to my litter box fur the whole day! Today I'm taking abundacatnaps to git me and my self all rested up so no snoozing tomorrow fur me! I was in such a deep sleep this morn that I slept thru the Editor's deadline to get The Guido Gazette out! Now lemme tell ya, that's what you call CATastrophic fur shure! But I'm bright green eyed and feeling purrky now. It's not Spring yet but my paws and me sprang into spurrring cleaning mode to tidy da house for my guests - now who left this hair band here? Don't they miss it? Ahhhh, I'm almost ready for a catnap! In case you're curious as a cat, I don't have a politicatical correct or incorrect party cuz I'm eyeTAILyun fromma over da oshun OR is it still called dat Old Country.... I guess you could call me a Diplomacat whose paws are crossed and hoping the White House adds a mighty meowster to that big place on Pencil Vania Avenue. Do we wanna guess how many mice race at night thru those halls? I'm exhausticatted just thinking about it! Some folks cat chat round the water cooler, others catch up in the litter box but today I'm talking pawsatively publicly, and about literature - literally I mean, this year I'm cutting back on my catnaps while expandocatting my reading catabilities. My smitten kitten self and me have found some CATZOWEY books which will kick off the new and unglued "Guido's Twitching Tails Book Club". Hey, that Cheekkawgo gal Opurrah has her book club, so why not the eyeTAILyun kitty? This week me and my pawself has PURRused a good ol' fashioned kidz book, that's undoubtacatically been around for most of my 9 lives plus some others. It's CARL GOES TO DAYCARE, and can you just imagine a robust rottweiller at the kids daycare club when the teacher gets locked outta da classroom and guess who takes care of the kidlettes?? Yep, uh huh, Carl does a doggone great job and it's more than meowster mayhem I'd say! And there's no catnip in the classroom cupboard, so this story is a au natural real story, not made in Hollywood or feline fiction. Remember you and yourself gotta be meowvalously comfy ... like kick back yur paws, sturrrrretch out in a sun ray and put your reading radar on! And it's imPURRtant to always love what yur reading, or at least hug yur book. I'm meowvalously enamored with Carl's books cuz he's wearing the eyeTAILyun colors on this book cover "Carl Goes Shopping"! Oh let's purrponder if Carl dropped into a Johnny Cat Fursocksee Boutique! Quit catnapping! Cuz "Guido's Twitching Tails Book Club" is now open for reviews, mews & amusement (a triple crown winner), so let's paw some pages and me and my paws hope the new book club doesn't end up in the litter box! While New Years revelers were prancing their paws around town with thoughts of popping bubbly bottles and meeting midnight deadlines, me and my Italian paws were making an Animal Assisted Therapy visit to someone I didn't even know the whole 364 days of 2008. Donning my certified "made by Johnny Cat Fursachee" vest, off I went on the last day of the year to the purrominent University of California Med Center- feline radar focused to find the serious surgery ward and the speshule terrificat lady who needed a PURRk up! Lots of catcophony in the elevator when folks stared at me in my Momma's back pack, as I bobbled (nope that's not a doll, that's a breathing moving cat!) Whatz with the folks who ask "Are you a real cat?" or "Oh my gosh I thought I taw a putty tat!" My meowster self thinks a mannequin has more up above then some of dem! In true Tony the Tiger fashion (the feline sugar coated flakes dude cat), it was grrrrrrreat to be there and the payshunt lady had brought her cat's blankie to the hospital - see fur yurself in the pics - it's a SF Giants blanket that belongs to her adoracat meowster, Wilson J Scooter who found me on the 'facebook for felines - CATSTER.com. Imagine this meowster miracle: Wilson reads about my AAT job on Catster - emails me to visit his momma (they really missed each other for weeks), and the rest is a nice Mew Years miracle story. And they don't even live in San Furfrancisco! The payshunt lady petted me and made me feel so comfurtably catzowey - that's her and me above. She was having a bad hair day she said. When the nurse took her blood preshure with a big gizmo machine, it had dropped - no no no, the gizmo machine didn't drop cuz nurse had it in her paws real good, the lady payshunt's blood preshure dropped! Ahhhh, the power of the paws! Got home from my job and found little visitors had arrived for the Pawty in the Italian limo - yep uh huh, we got the BuCATi car and painted the town with catnip while our driver purrpondered how to git us to the Kit Kat Klub before the stroke of midnight. Yur wondering if I made a New Mew Years resolution? Fur shure, I purromice to be exacticatically the same - no meowvalous or catastrophic changes, no hiss fits, just me and my optimisticat self doing what I always do.... starting my day the Guido way! Happy Meowvalous New Year!